True AWD gives you the ultimate grip to put that 88 horsepower to work in the corners, whoops and loose terrain. It’s the easiest to use and fastest responding on-demand system, automatically engaging all four wheels when you need more forward traction and reverting back to 2WD when you don’t. This means less wear and tear, easier steering, and maximizes power when you need it most. The 3-Link race inspired rear suspension maximizes traction and power in corners and straightaways. Tires lean into the corner through the suspension travel, planting more tire surface on the ground to create positive tire camber for more control. The trailing arms also minimize wheel scrub for superior straightaway power, helping you stay true to your line. Only RZR features the Polaris-exclusive Optimized Mass Design. The engine and other components are strategically placed to create the absolute lowest center of gravity, for the ultimate in razor-sharp performance. Exclusive front suspension geometry results in less steering effort on non-EPS models, making maneuvering the Ranger RZR XP easier at slower speeds. Exclusive ITP 900 XCT tires – Standard on RZRXP – feature a unique directional lug pattern providing exceptional cornering and straight-line traction capabilities. Performance brake calipers and large diameter ventilated rotors on all four wheels provide the stopping power extreme sport riders need. New flat-bed design of rear cargo box has greater volume, with 300 pound capacity and Lock & Ride accessory system. Industry first factory LED headlights shine a high-intensity bright white beam to turn night into day, and throw light forward far beyond conventional halogens. Passenger-side glove box has three gallons of space for convenient, water-resistant storage. Comfortable operation is enhanced by tilt steering with a wide range of motion (10 inches), adjustable and interchangeable bucket seats, and an adjustable passenger handrail. It's 29% quicker than the next closest competitor. 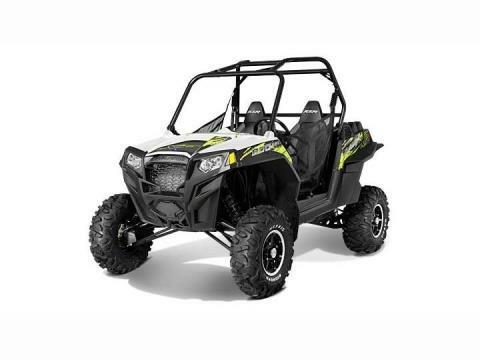 This revolutionary acceleration is made possible by the 88 HP lightweight engine and total vehicle weight combined with big-time power to the ground. The result is loads of torque to all four wheels and unsurpassed off-road acceleration. Specifically built to optimize power of the Polaris ProStar™ 900 engine, its high-torque capacity delivers superior performance and handling. This means more power to the ground, less driveline noise and lighter weight. The innovative lightweight design features a helical cut final drive with optimized gear geometry to maximize efficiency. Specifically built for an extreme performance Side x Side. The Polaris ProStar™ 900 engine features industry-leading 88 horsepower, Dual OverHead Cams (DOHC), 4 large valves for high RPM power and 180 degree crank shaft for balanced performance. This delivers fast throttle response, groundbreaking power and revolutionary acceleration. The 3-Link Trailing Arm IRS, paired with premium Fox Shocks, creates a monstrous 14 inches of terrain-absorbing rear travel. Match that with an astounding 13.5 inches of front travel and 13 inches of ground clearance and no comparison is required. Hands down, Ranger RZR XP owns the desert, the dunes and any wide open space. Standard on all 4 corners are premium Fox Podium X 2.0 Shocks with piggy-back reservoirs - compression and preload adjustable. Pair that with Dual-A-Arm front suspension with 13.5 inches of travel and it soaks up the rough stuff and delivers a smooth, precise ride every time. We designed the 3-Link Trailing Arm IRS to handle all that power and keep the ride smooth. The 3-Link design consists of two extra-long radius rods and a far forward-connecting trailing arm resulting in a strong yet lightweight system.